Here is a video from one of our Carwash customers showing the N-SPEX STIX at the entrance of one of his washes. He has even added a incridi-bullet camera to the right leg to allow viewing of he staging area. The purpose of the N-SPEX System is to document the condition of every vehicle that enters and Exits your facility. Customers that use the N-SPEX system have reported that the system has paid for itself in less than 6 months due to the deductable savings on their insurance. In fact, one Customer says that 2 claims in the same month that were avoided with solid evidence from the N-SPEX system, more than paid for the entire N-SPEX equipment costs. 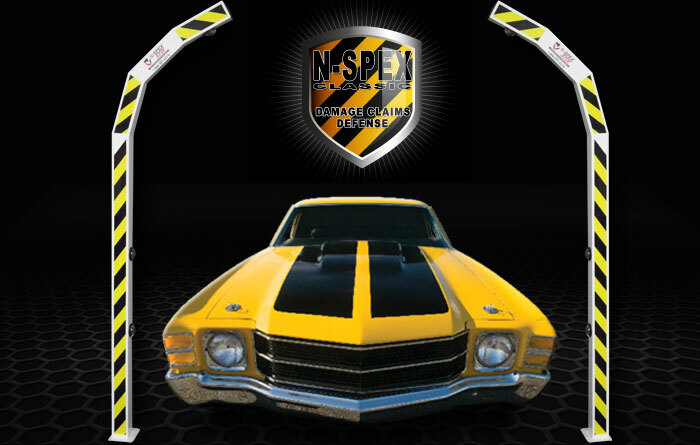 The N-SPEX vehicle condition documentation system Entry and Exit Arches document the condition of every vehicle that enters and exits your property. Sony 960H Ex-view HAD CCDII, 650 TV Line Cameras! Shutter Speed NTSC:1/60~1/100,000 sec. PAL:1/50~1/100,000 sec.